Today is Hinamatsuri, Girls’ Day, Girls’ Festival or Dolls Festival in Japan. I remember being intrigued with the tall displays of the imperial court when I was a girl. Some were so elaborate and elegant – yes, I would have loved a collection of my own! The kanji　「雛・ひな」hina defines as “chick, duckling, squab [fledgling bird] and doll”。「祭り・まつり」Matsuri means “ritual, offer prayers, celebrate, deify, enshrine and worship”. The origins of this festival trace back to hina-nagashi in the Heian Period. So there’s more to this than just celebrating girls and dolls – also a little spiritualism and “magic” (perhaps). The photo is ancient – from my dad’s collection, something “generic” so I’m not sure that he even took it. He must have used it though, to talk about Japanese culture in our trips “back” to the US. At any rate, it gives me pause to look back and there’s always something new to learn in the process. The month began with those “March winds” – it was blustery and I’ve had some custom work on the line this week. It was uncharacteristically warm – in the 80s – not at all March-like. The real reason for this entry? I changed the times for the opening for “Filaments”, the upcoming exhibit mentioned in my last blog. I’ve also updated it on the Events page – 6-8 p. instead of 5-7 p. Hope to see you there! Shirogake (white shadow) shibori has been dangling like a carrot before me for some time. The pattern mystified me to be honest. Then a friend went to an out of state exhibit where a kimono in the pattern was on display. She sent a photo and I was hooked (again). To bring it about took some time. 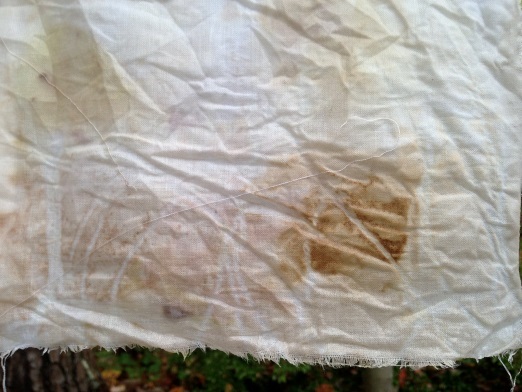 After stitching the pattern and pulling it up, all I wanted was to dye it – see those results! In my haste and excitement, I forgot the next step – wrapping it against a rope or pole. Then, I realized what I was doing and stopped. I wrapped it against a pipe and continued on, hoping I hadn’t spoiled the shirokage. If I did, well, I’d try again. In removing the piece from the pole, there seemed to be some resist. So, something worked. The proof would be in removing the stitches and it seemed to work. The question was whether or not the pattern could be read. It isn’t completely shiro, but the pattern can be read. It works…well enough to at least give an understanding of the technique and theory. This was practice, theory, learning, experiment…it’s all it can be and quite satisfying. Yes, I would do this again. the pattern – not completely “shiro” and blue, but it can be read. Like a lamb or a goat? Earlier this month I would have said “Spring came in like a lamb” and then I had to rethink things a bit – maybe more like a goat. Still, what’s ahead seems promising. 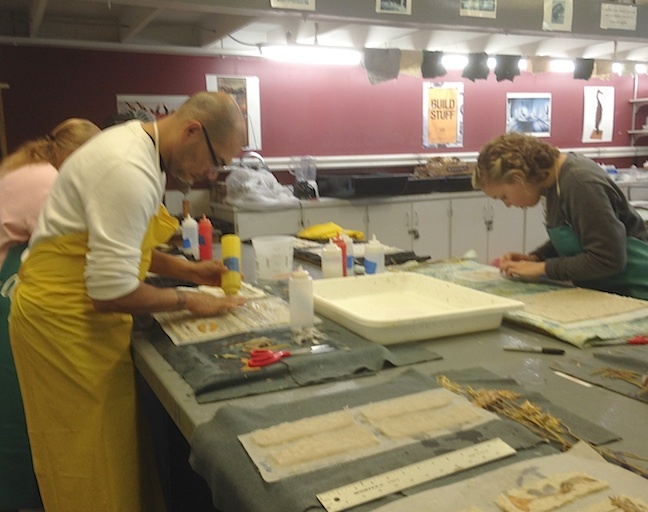 One thing, is a class, just added to my Workshops page – in May – devoted as per usual to shibori & indigo, but also to making a noren. Some of my winter make time was devoted to the above noren – just one example. In this case I was was inspired by Serizawa, a katazome (paste resist) artist – an homage. I love his work. The characters, hiragana, say ようこそ(youkoso)/Welcome. It hangs in my front hallway. Other promises and welcoming spring things…well, lots of little green sprouts are making their appearance in my small greenhouse. I’ve also seen a few butterflies in spite of the up and down temps these last few days. Spring. 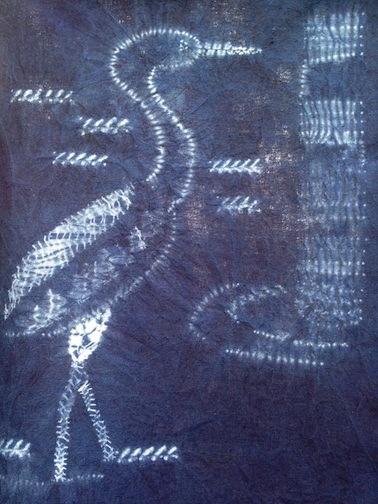 Sometimes it’s play – no particular intent, just a quick response to the cloth – in shibori and dyed in the vat. They were created for an event and were an omiyage – a favor or rememberance. So, to be honest, there was some ‘intent’ but the pieces were unplanned. That’s the point, kind of like scribbling to loosen up the hand, only it’s my brain or my eyes that need it. It only makes sense to work with the traditional and go on from there. Sometimes I’ll see something that jogs the memory or evokes a feeling. Here’s the same pattern in a larger context. It isn’t the same, but there were more folds to work with this time around, also more accidental wrinkles. They add to the pattern. Another bit of play referencing those same clothesline pieces. The concern is always the dye, its hue, depth of hue and simply how it interacts with the fibers. It seems to be a constant learning and re-learning no matter how simple the piece – like practicing the piano. 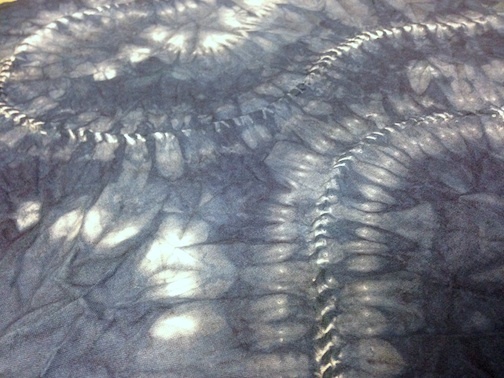 As in any other medium, there seems no limit to the imagery one can create in working in shibori. That’s one of the things I love about it. The challenge lies in its engineering aspects. The image below is student work, but it wasn’t child’s play, it was work. I was fortunate to witness some of the aspects of the making of this piece – and yes, part of it may have been play – certainly experimental. 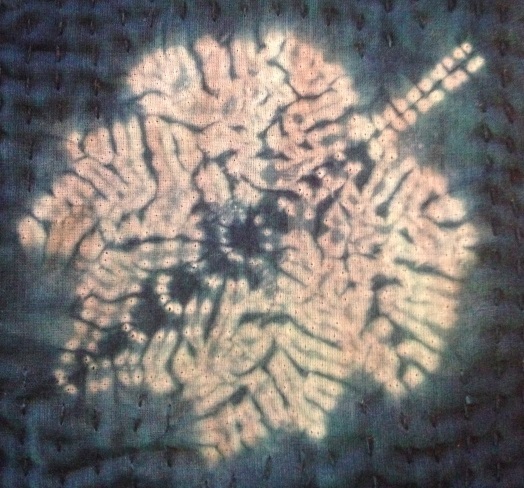 It was a dip at a time, letting it oxidize, assessing it and repeating the process until the dye was deep enough or that it covered the desired areas. I love the playful aspects of the piece. It also takes me to a long ago place, a certain lake and some memorable sailing. Ao wa ai yori dete ai yori ao shi. The translation has to do with blue being stronger/better/beyond the blue in the indigo plant (at least it’s a reference to an original color source) or something of that ilk. At any rate, it refers to the student being better than the teacher – quite often the case and certainly in my experience many times. So, I wonder if this has more to do with becoming better – growing past the teacher, which is what is wanted in the end. That may be the message in the proverb and to the teacher as well. How is it that “nature” decided it was time for the indigo harvest? 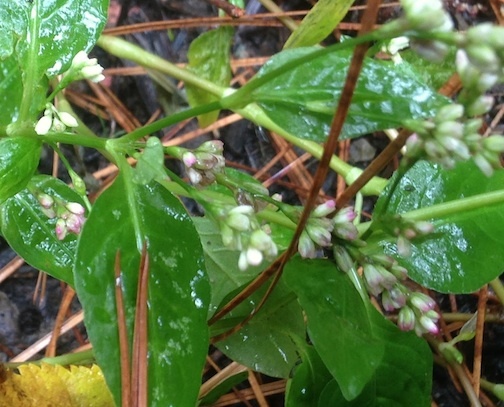 Yesterday, in my routine garden walk-through, I found no blossoms at all, save for a few leftover scraps. Both beds had been pretty thoroughly cleaned out. Was it deer? It had to have been – tasty greens, I suppose, but they weren’t greens. I had no idea they were so discriminating. 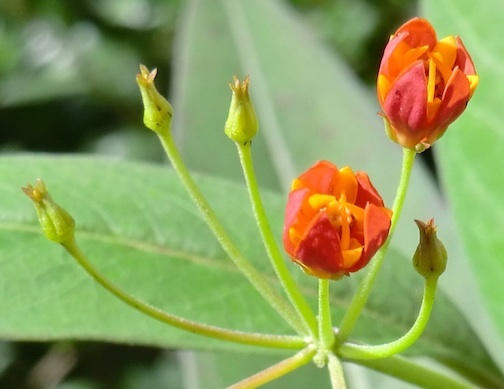 Only the tops where blooms (and seeds) grew were removed. Dessert perhaps? I’ve felt fairly immune from these visitors and really had no idea they were coming in so close to my little flower beds. Next year, I’ll approach things differently and with them in mind. 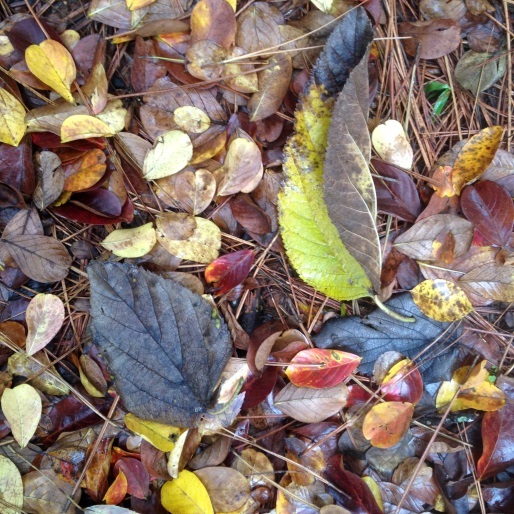 crape myrtle, mulberry for starters, also sweet gum…. 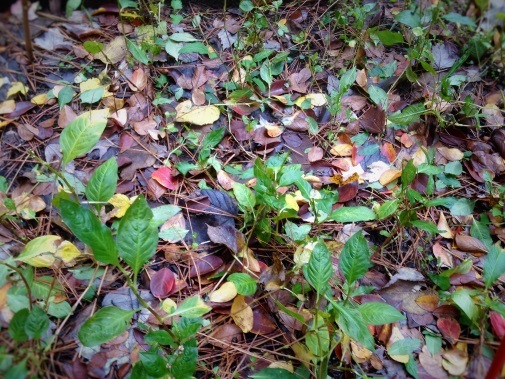 There’s an abundance and a variety of leaves in my small yard. I’ve added trees and shrubs as well, but mostly, I know that my presence is an imposition on the surrounding nature. My attempts to tame and remove whatever wild sprouts up is basically futile. Even though, I seek to tame it, I love the colors, blossoms produced and the fauna it attracts. And if you’re a reader, you’re aware that I also enjoy documenting it. From time to time, it makes its way into my making (above detail). Lately, though, after attending the Waitzkin workshop and seeing various blogs and imagery elsewhere, I thought while the leaves were “ripening” on my lawn, I should gather some and see what could be done with them. faint outlines of sweet gum? While I didn’t succeed, I didn’t entirely fail. I see the potential. 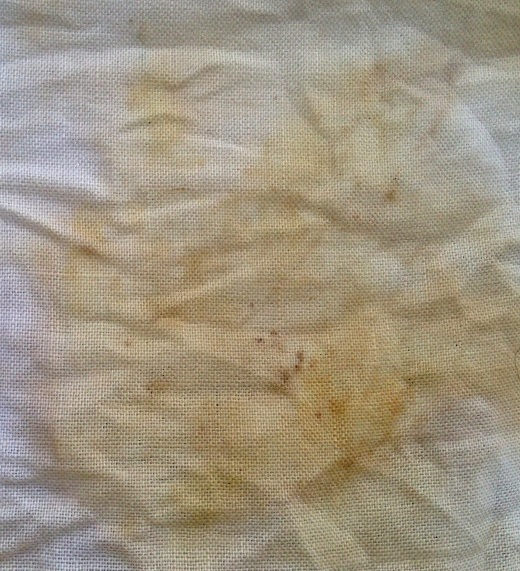 For one, I didn’t mordant the cotton (that may have been one aspect of it’s not working). There may have been other elements that played a part as well. I did wrap my leaf bundles securely around cherry tree sticks and boiled them for roughly an hour. That resulted in a pleasant aromatic “tea”. They soaked in it for a couple of days and then were unwrapped. 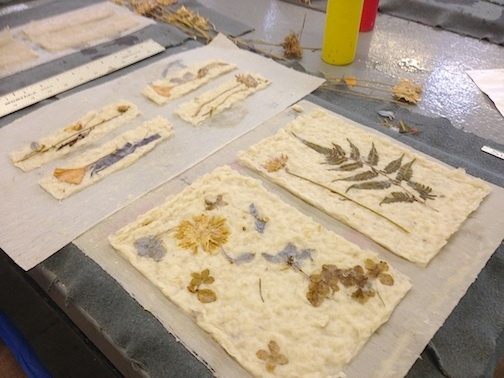 It was a first “just jump in and do it” – never mind the prep – stab at eco-printing. I realize there’s lots to learn in the process, and using what’s in my backyard has tremendous appeal, especially this time of year.